I keep telling you that visiting Pridnestrovie is a very safe activity. Well, here’s more proof: a good ol’ American dad with his two cornfed boys visited Tiraspol and Bender… and had a wonderful time. This was one of Lucas’s favorites. The tank is a Soviet T-34 (had to look it up). I thought it was pretty cool how the red Soviet star and flag with CCCP was painted on. I’d assume it’s been touched up many times. Other than that, he’s right. That tank exudes a constant siren song to climb on top of it. It really is a very “climb-able” tank. And yes, it’s a real T-34 tank, but it’s pretty tiny, about the same size as a small car. 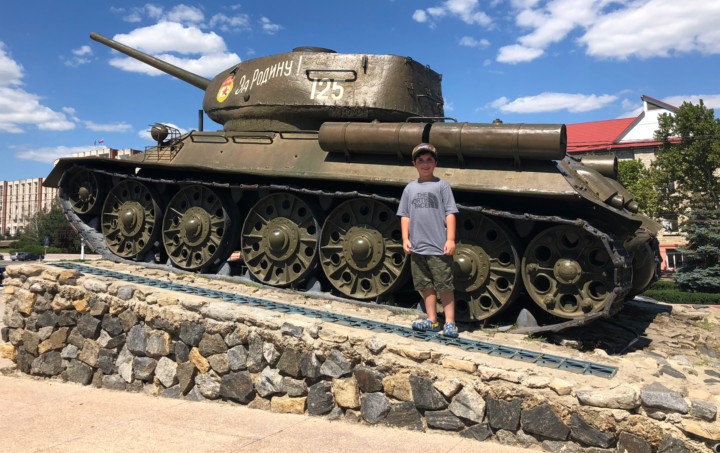 BTW, kids (of all ages) in Tiraspol love climbing on that tank. If you’re ever in town and are worried about being disrespectful or something, don’t be! At the end of the memorial plaza is a large wall with various plaques. While I’m not sure what was written on them, Lucas and I did spend some time checking out the statues of Transnistrian freedom fighters. Be sure to read the rest. And have a wonderful time with your family if you come visit!